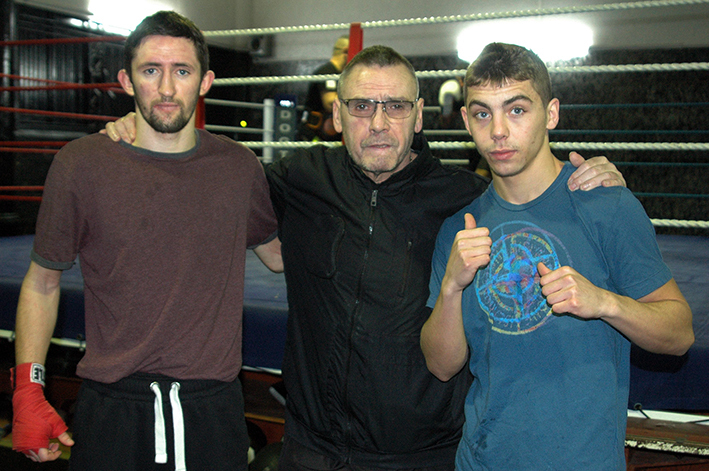 London – Monday, 26th January 2015 – It’s been a rather busy start to the New Year for the ever hardworking Johnny Eames and his entire TKO crew, whilst most of us took time off to enjoy the Christmas and New Year festivities, not so for Team TKO, who were busy at work, either with the rebranding and a move to new facilities for the famous TKO gym, or preparing for upcoming fights. The gym, which had been based in Canning Town for the past eight years, has now relocated to Hackney and has been rebranded as the Champions TKO Boxing Gym. With such a major project to undertake over the holiday season you would expect that some other elements of the multi-disciplined TKO would be put on the back burner, but no, Johnny has been as active as ever in signing new boxers, as well as burning the midnight oil getting fights for his stable of boxers, or negotiating Championship fights for the senior prospects in the squad. When he finally found a spare few minutes, in between the seemingly never ending stream of phone calls, the affable Mr. Eames spoke briefly about the major changes, his exciting new signings, as well as the upcoming fights for his charges. “Exciting times, it’s been hard work, but I’m sure it will all be worth it. There’s still a lot of work to do with the gym, at the moment we’re only using half the floor space available, so we’re only training the pros there until we get to knock through to the other unit, then and only then when the gym’s completely finished will we start operating it full time. The change of location has done us a big favour, we’ve got rid of a lot of the dead wood we had around us, now we have a really good strong team here, there’s myself, Rio (Gianluca Di Caro) and Mehmet Aba on the I suppose management side, if you can call it that as it’s the running and marketing of everything. On the coaching team side, we have Brian O’Shaughnessy, Mo Hussein, Brian Lawrence, Mark Lowe, Mark Reefer, Larry Edwards, Dave Butcher, Mehmet Aba and of course myself. As I’m going to concentrate mainly on boxers management and coaching, if any fighters out there are looking for management or coaching, they should give me a call. Talking about management, we’ve just had two first class young former amateur stars sign with us, the first is Mickey O’Rourke, who used to box for Dale Youth, he’s a very good fighter and I really do think this kid is going to go all the way, he’ll cause a few upsets along the way. The other is young Danny Arnold, he’s nineteen years of age and has won everything there is to win in the juniors and I mean everything. He’s an absolute natural talent, I put him right up there with the natural abilities of our Kevin Lear. Only his application is all wrong at the moment, he’s going to be a challenge but I’m looking forward to the challenge and if I can make this kid train right we’ve got a Champion for definite. Fighters wise, we have seven out in quick succession, it all kicks off this week with four of the TKO boys out at York Hall on Friday, the 30th January. From the gym itself, we have Onder and Siar Ozgul, they’re both good boys, Siar steps up for his first six rounder and Onder remains on a four for this fight. They’re always crowd pleasing boys, always bring a good crowd to the table and I’m sure it will be a good night for the boys. Also on this show is Antonio Counihan, who is probably the jewel in the crown of the TKO fighters, this kid is outstanding, he’s not trained by us here at the TKO, but he’s managed by myself and is probably the jewel in the crown as I said. He’s got everything, absolutely everything, what’s more he’s got a great team around him in his dad and Jon Pegg. He always brings a big crowd down with him and always puts on a great performance. After this fight we’ll probably have him fight for a title, probably MBC International or similar, so let’s see how it goes, either way I’m really looking forward to it. Also on this show Tasif Khan will be making his maiden outing under the TKO banner, he’s totally new to us, I haven’t seen him fight yet, he’s been out of the game for a couple of years, but he’s got a decent record and if enthusiasm wins titles then this kid’s already a Champion, because he drives me mad on the phone wanting to know everything, which is good, I like that in a fighter. He’s seven and one, but as I say I’ve never seen him fight so can’t judge him on ability, but what I can comment on is if he fights as good as his enthusiasm then he’s a very good fighter and with seven good wins under his belt already am sure he is. Next up we have Tommy Martin, who has an English title fight against Ricky Boylan coming up on the big Matchroom show at the O2. It’s a tough 50/50 fight, it’s a fight I believe Tommy can win, otherwise I wouldn’t have put him in it. I have a lot of respect for Ricky, as he was once a TKO fighter, you don’t expect easy fights when you’re at this level, so obviously it is going to be a tough fight, but I’m pretty sure Tommy will come through the winner. Also on the 02 show on the 31st is Charlie Edwards, who will be making his highly anticipated debut. Big things are expected from this kid, it’s our job at the TKO to keep this kids feet firmly on the ground and make sure he does his job right. If training wins titles, then this kid is a World champion already, he just doesn’t stop training, he totally lives and loves the game. He’s got a great trainer in Brian O’Shaughnessy, he’s doing a fantastic job with him and from my side it’s an honour to be part of young Charlie’s journey. Next up on the 7th February, is our debutant, Mickey O’Rourke, who will be fighting on the Mickey Helliet show at the Camden Centre. I’m really, really excited about signing Mickey, I’ve not been that excited about a new kid’s debut since Kevin Lear days, I really do rate this kid, I really do believe this kid is going to go a long, long way, in the boxing game and I’m certain he’s going to be a big ticket seller, he has a big family and I’m looking forward to meeting them all. For further information on Champions TKO Boxing Gym and their stable of boxers, please see the website www.tkoboxinggym.com also please follow on Facebook and on twitter @ChampionsTKO.